Basecamp is one of the coolest companies in the world. Its headquarter is in Chicago, but everyone working there is free to live and work from anywhere else in the world. This is how, not much surprising, many of the employees of Basecamp work from home and other convenient locations. The company has an amazing startup story, it’s really interesting and completely happy to place it on this site. If you come across this Basecampers, I wish you luck and successful business. Basecamp is an on-line project management software, used by thousands of companies and individuals from around the world. The software is offered as a SaaS and it actually works in the so-called cloud. User use a browser to use the app, which makes it completely platform and device independable. It was first released in 2004 and has been constantly improved till now. 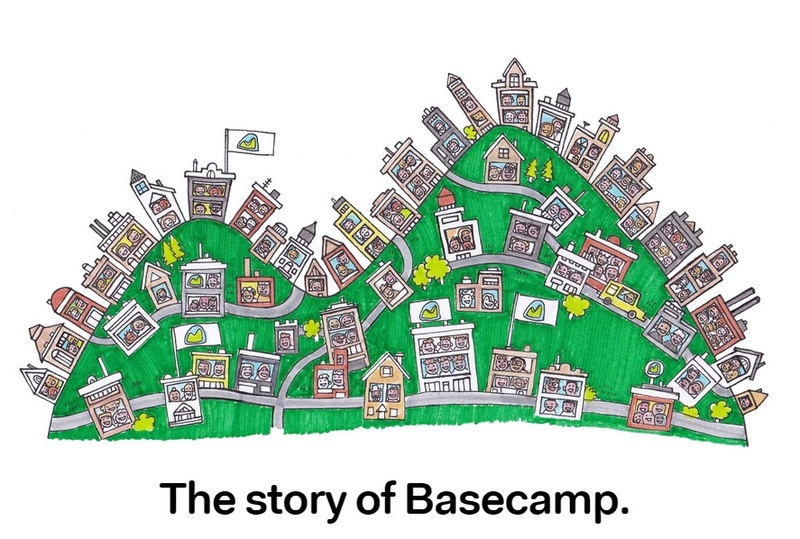 The story of Basecamp.com story was initially published on the company’s site. Its author is the CEO and founder of the business – Jason Fried. It all started back in 2003. Back then we were a web design firm. Companies hired us to re-design and simplify their web site. Business was great and we were busy. But we were disorganized. With so many concurrent projects, things began to slip through the cracks. Projects dragged on too long. We dropped the ball on key deliverables. We had some major miscommunication (“Wait, who said that? We did? When? Where?”). Back then, we relied on email for everything. Email’s great for many things. But it’s not great for long-running projects. Things get lost, people get left out of conversations, there’s nowhere to go to see what’s left to do. Know what I mean? So we started looking for a project management tool. We needed something to help us communicate ideas, organize the work to be done, and present work to stakeholders. Simple as that. We tried a few tools, but they were complicated and too hard to use. So we slowly slipped back to using our old standby – email. Our problems continued. Frustrated, we decided to build our own simple project management app. A few months later we had something ready. We started using this tool with our existing clients. Immediately projects ran better! We regained the sense of order and calmness we’d been craving. And clients noticed – they really appreciated the improved communication and organization. Then our clients started asking us what software we were using to run these projects. Turns out they wanted to use it for their own in-house projects! Hey, maybe we’ve got a product here! So we polished it up, priced it fairly, and put it on the market. On February 5th, 2004, Basecamp was born. We announced it on our blog. Within a month, we had about a hundred paying customers. Hundreds more followed. Within a year, Basecamp was generating more income for us than our web design business. We had a hit! So we stopped designing web sites and went all-in on our software business. Soon we started hearing stories of Basecamp being used in schools, governments, churches, consulting firms, publishers, and just about every other industry on earth. The stories keep coming and we keep growing. Today, 10-years after Basecamp first hit the market, nearly 15,000,000 people have worked on a project with Basecamp! And every week, thousands of companies sign up to use Basecamp. Please, consider sharing this writing on your favorite social site. This will help our site produce more cool start up stories like it. Thanks!